Facebook has established itself as the biggest photo sharing service on the Internet — by far. But until fairly recently, the maximum size of uploaded photos was a frustratingly small 604 pixels, doing nothing to take advantage of the increasing ubiquity of high-resolution cameras. And that’s a problem when your friends are using Facebook as the primary way to share memories of special events like weddings, graduations, parties, and chubby bunny contests. Things started to improve in March which it boosted the maximum resolution 20% up to 720 pixels. And now the Photos app is getting much, much better: Facebook is boosting the maximum photo size by 8x, up to 2048 pixels. Now you won’t have to squint when you go to relive your memories a few years (or decades) down the line. This may also make the app more attractive to users who have been turning to Flickr for high-quality uploading. 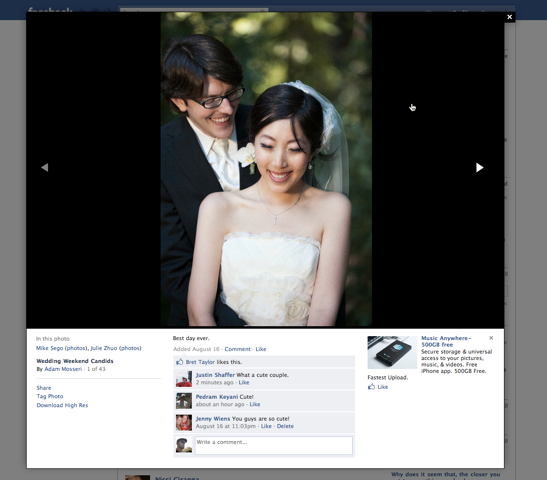 In addition to the boost in maximum photo size, Facebook is also making some UI changes. The site is going to start rolling out a new light box-based photo viewer that lets you view photos without jumping between pages. Facebook has also improved its UI for tagging friends, making it easier to tag the same person in multiple photos. 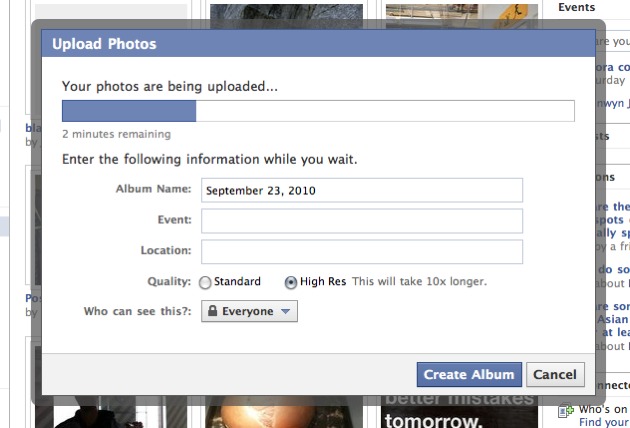 Finally, Facebook has once again rebuilt its photo uploader for stability and performance improvements. The features aren’t live for everyone yet, and will be rolling out over the next few weeks.